Would you like a list of marketing ideas that will help you to boost your business? 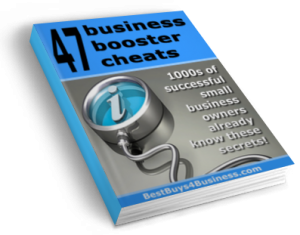 My unique 7 page book includes 47 business marketing ideas that you can use to market your business and yourself, plus they are mostly free or cheap strategies. How good is that! Top 5 Good Business Ideas for a Home Business – Exclusive! Cafe Owners: Download Your Book Now!